Using a baby formula with low iron can cause problems for your baby. The American Academy of Pediatrics recommends that all babies use iron-fortified formulas if not drinking breast milk. Infants need iron because it is necessary for proper growth and nutrition. An iron deficiency can cause developmental delays and may be associated with lower intelligence when the child enters school. A lack of iron can also lead to iron-deficiency anemia where the growing baby cannot produce enough red blood cells. Most pediatricians draw blood to test for anemia at the child's first-year doctor's appointment. Constipation and other stomach upsets have been blamed on iron in infant formulas. Many parents over the years have looked for low iron or even iron-free formulas because of the digestive problems supposedly caused by the iron. However, studies that were done on this issue have actually disproved the iron and constipation relationship. Does Low Iron Formula Help With Constipation? The iron in baby formulas does not typically cause constipation. Therefore, it may not be necessary to switch to a low iron formula if your baby is experiencing constipation. Another reason you may not want to switch is that the iron content in the formula is very important for your growing baby's health. If your baby does not get enough iron and becomes anemic, this could lead to other problems such as slow neurological development. It is always best and extremely important to consult your doctor with your concerns. Can Changing Baby Formulas Cause Constipation? Constipation may be formula-related if your baby has allergies to the milk proteins found in the formula. This can cause discomfort and constipation. The milk-based formulas are not all the same so trying a different brand may help or even switching to soy may do the trick. While soy may cause the stools to be firmer, it should still help with the constipation problem. Additional water or prune juice. Less rice, bananas, or applesauce. More peaches, prunes, plums, and pears. Milk-based formulas are the most commonly recommended formulas. They contain heat-treated cow's milk proteins and lactose from cow's milk. These formulas also contain additional vitamins and minerals comparable to what is contained in breast milk. For infants who are lactose-intolerant or have an allergy to cow's milk formula, soy-based formula is available. If your baby is fussy or has diarrhea after feeding, you may want to consider switching formulas; changing to soy formula may improve the symptoms. 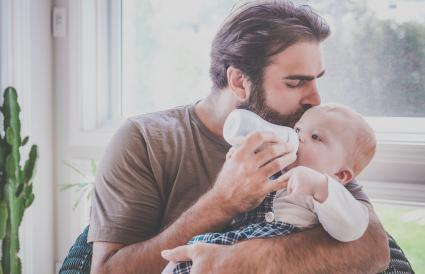 A lactose-free formula that still contains cow's milk proteins may also solve this problem in infants who are lactose-intolerant; a few lactose-free versions are available as well. Some parents start these formulas first because there is a history of food allergies or lactose intolerance in their families. Most formulas for premature infants are cow milk-based and are formulated for the needs of a premature infant. These formulas have more protein, calories, vitamins, and minerals to allow the infant to put on extra weight and maintain his/her growth. Some infants may have rare metabolic disorders where they are unable to digest or tolerate various components of typical formula. Specialty formulas are created for children with conditions like phenylketonuria (PKU) and tyrosinemia. Since these conditions are rare, these formulas often have to be ordered from the pharmaceutical company. Your physician and dietitian will advise you about the use of these formulas. According to The American Academy of Pediatrics (AAP), babies that are not breastfed or partially breastfed should use iron-fortified formula. They do not recommend low iron formula. After much evaluation, if your doctor believes that the low iron option may be best for your baby, he will let you know if you need a prescription or will guide you on where you can purchase it. These low iron formulas are typically not available to purchase over the counter; however, you may be able to find it online. Enfamil Premature Low Iron Formula for preemie or low-weight babies. It is a milk-based formula that contains important nutrients to help with the baby's growth. The ready-to-use 2 oz. nursette bottles can be found on Amazon. Similac Low Iron Formula is for infants that would benefit from lowered mineral intake or have impaired renal function. The powder formula can be bought online on Walgreen's website. If you are concerned about your baby's formula, you should discuss any questions you may have with your pediatrician. He may have other suggestions or options that you can try. Changing to a low iron formula without your physician's knowledge may leave your baby without the important and necessary nutrients that he or she needs.